The 1948 Arab-Israeli War is called the War of Independence by Israelis and al Nakba, the catastrophe, by Arabs. The War was the first in a series of wars in the Arab-Israeli conflict. This war established the state of Israel as an independent state, with the rest of the British Mandate of Palestine split into areas controlled by Egypt and Transjordan. Following the defeat of the Ottoman Empire in World War I, the League of Nations granted the British a mandate over the former Ottoman possession of Palestine. This area was the target of Zionist aspirations for a Jewish homeland or state, and thus it saw a large influx of Jewish immigrants escaping persecution in Europe and with them capital. The immigrants, the ruling British, and the Arabs came into conflict many times during the Mandate, most dramatically during the Great Uprising from 1936 to 1939, when Arab general strikes and riots targeted both the British, the Zionists and Sephardic Jews who had lived their for generations. The British eventually quelled the uprising, with help from the Jewish Haganah. At the same time, many of the surrounding Arab nations were also emerging from colonial rule. Transjordan, under the Hashemite ruler Abdullah, won independence from Britain in 1946, but it remained under heavy British influence. The British placed Abdullah's half-brother Faisal on the throne in Iraq. The Anglo-Egyptian Treaty of 1936 included provisisions by which Britain would maintain a garrison of troops on the Suez Canal. From 1945, Egypt attempted to renegotiate the terms of this treaty, which was viewed as a humiliating vestige of colonialism. Lebanon became an independent state in 1943, but French troops would not withdraw until 1946, the same year that Syria won its independence from France. The new Syrian republic, however, feared its own army, which had been organized by the French as a tool against Syrian nationalists. In 1945, Egypt, Iraq, Lebanon, Saudi Arabia, Syria, Transjordan, and Yemen formed the Arab League to coordinate policy between the Arab states. Iraq and Transjordan coordinating policies closely, signing a mutual defense treaty, while Egypt, Syria, Lebanon, and Saudi Arabia feared that Transjordan would annex part or all of Palestine, and use it as a basis to attack or undermine Syria, Lebanon, and the Hijaz. On November 29, 1947, the United Nations General Assembly approved a plan which partitioned the British Mandate of Palestine into two states: one Jewish and one Arab. Each state would be composed of three major sections, linked by extraterritorial crossroads, plus an Arab enclave at Jaffa. The Greater Jerusalem area would fall under international control. Both Jews and Arabs criticised aspects of the plan. 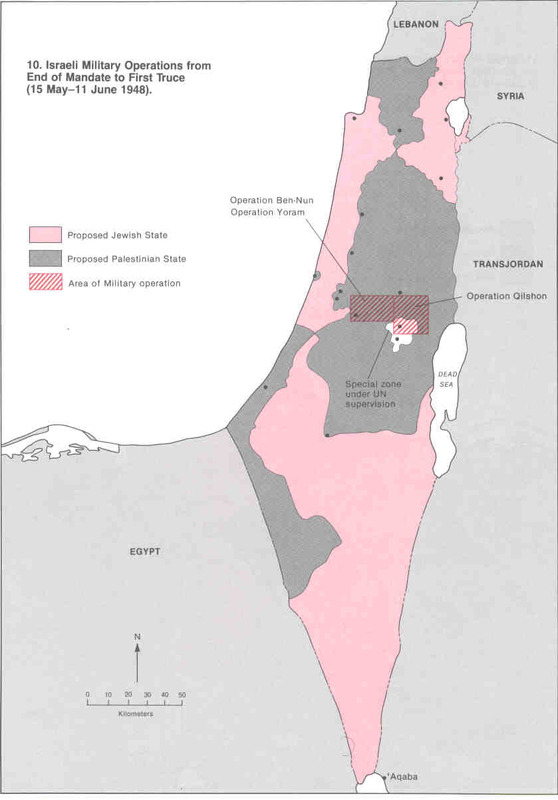 The Jewish population largely welcomed the plan, but the Arab leadership and some Jewish opposition groups rejected it. Right after the UN partition plan was approved, heavy fighting broke out in Palestine. The British representatives, having no desire to maintain order and their force waning, effectively left the Jews and Arabs alone to fight between themselves. During the next six months, most of the fighting was be made using guerrilla tactics, small Arab and Jewish forces conducting brief gunfights at various spots, without achieving any territorial goal but for the protection of the de-facto limits. On December 18 the Palmach, the kibbutz-based force of the Haganah commanded by Moshe Dayan, attacked the village of Khissas. Three weeks later the first Arab irregulars arrived and the Arab leadership began to organize Palestinians in order to wage guerrilla war against the Jewish forces. Some of the Arab fighting groups became the Fedayeen, the forerunners of the Palestine Liberation Organization. On January 9, 1948, approximately 1,000 Arabs attacked Jewish communities in northern Palestine. The Arabs concentrated its efforts on cutting off roads to Jewish settlements and towns with mixed populations. At the end of March, the Arabs had managed to cut off the vital road going from Tel-Aviv to Jerusalem where 1/6 of Palestine's Jews lived. The Arab League created a volunteer army, the Arab Liberation Army, led by Arab nationalist Fawzi Al-Qawuqji, which entered northern Palestine in January. The Haganah armed itself with arms bought from Czechoslovakia. The Yishuv began working on a plan called Plan Dalet (or Plan D). Meanwhile, frantic diplomatic activity took place between all parties. On May 10, Golda Meir represented the Yishuv in the last of a long series of clandestine meetings between the Zionists and Transjordan's King Abdullah. Whereas for months there had been a tacit agreement between the Zionists and Transjordan to prevent the establishment of a Palestinian state, with Transjordan taking over the Arab areas, at the May 10 meeting Abdullah offered the Zionists only autonomy within an enlarged Hashemite kingdom. This was unacceptable to the Zionists. Nevertheless, the Transjordanian army refrained from attacking the designated Jewish areas of Palestine in the ensuing war. On May 13, the Arab League met and agreed to send regular troops into Palestine when the Mandate expired. Abdullah of Transjordan was named as the commander-in-chief of the Arab armies, but the various Arab armies remained largely uncoordianted throughout the war. On May 14, the British Mandate expired. The State of Israel declared itself as an independent nation, and was quickly recognized by the Soviet Union, the United States, and many other countries. Over the next few days, approximately 1,000 Lebanese, 6,000 Syrian, 4,500 Iraqi, 5,500 Egyptian, and 6,000-9,000 Transjordanian troops entered the former Mandate. Together with the few thousand irregular Arab soldiers, they faced a Zionist army numbering 30,000-35,000. Both sides increased their manpower over the following months, but the Zionist advantage grew steadily. The heaviest fighting would occur in Jerusalem, between Transjordan's Arab Legion and the Israeli forces. Abdullah ordered Glubb Pasha, the commander of the Transjordanian Arab Legion, to enter Jerusalem on May 17, and heavy house-to-house fighting occurred between May 19 and May 28, when the Arab Legion succeeded in expelling Israeli forces from the Arab quarters of Jerusalem. Iraqi troops failed in attacks on Jewish settlements, and instead took defensive positions around Jenin, Nablus, and Tulkarm. During the following months, the Syrian army was repelled, and so were the Palestinian irregulars and the ALA. In the south, an Egyptian attack was able to penetrate the civilian-manned defences of several Israeli civilian kibutzes, killing their inhabitants. This attack was stopped near Ashdod. The Israeli militia groups managed not only to maintain their military control of the Jewish territories, but to expand their holdings. The UN declared a truce on May 29 which came into effect on June 11 and would last 28 days. The ceasefire was overseen by the UN mediator Folke Bernadotte. An arms embargo was declared with the intention that neither side would make any gains of the truce. But the Israeli side managed to obtain illicit weapons from Czechoslovakia, while Arab forces did not gain significantly more weapons. At the end of the truce Folke Bernadotte presented a new partition plan that would give the Galilee to the Jews and the Negev to the Arabs, both sides rejected the plan. On July 8, Egyptian forces resumed warfare, thus re-starting the fighting. The ten days at the height of the summer inbetween the two truces was dominated by large scale Israeli offensives and an entierly defensive posture from the Arab side. The three Israeli offensives that were carried out had been carefully crafted during the first truce in anticipation for its end. Operation Dani was the most important one, aimed at securing and enlarging the corridor between Jerusalem and Tel Aviv by capturing the roadside cities Lydda (later renamed Lod) and Ramle. In a second planned stage of the operation the periphal cities Latrun and Ramallah was also to be captured. The second plan was Operation Dekel whos aim was to capture the lower Galilee including the Arab city Nazareth. The third plan, to which fewer resources were allocted to, Operation Kedem was to secure the Old City of Jerusalem. (map of the attacks: ). Lydda was mainly defended by the Transjordanian Army, but also local Palestinian militias and the Arab Liberation Army was present. The city was attacked from the north via Majdal al-Sadiq and al-Muzayri'a and from the east via Khulda, al-Qubab, Jimzu and Danyal. Bombers were also used for the first time in the conflict to bombard the city. On July 11, 1948 the Zionists captured the city. The next day, July 12, 1948 Ramle also fell to the Zionists. July 15-16 an attack on Latrun took place but did not manage to occupy the city. A desperate second attempt occurred July 18 by units from the Yiftach Brigade equipped with armored vehicles, including two Cromwell tanks, but that attack also failed. Despite the second truce which begun on July 18 the Israeli efforts to conquer Latrun continued until July 20. After Ramle and Lydda had been captured, the Zionist leadership was surprised to see that the inhabitants didn't flee spontaneously. That was a large problem to them as they couldn't leave such a large and hostile population in that area. Therefore some 60,000 inhabitants were forcibly expelled from their homes starting from July 14. While Operation Dani proceeded in the centre, Operation Dekel was carried out in the north. Nazareth was captured July 16 and when the second truce took effect at 19.00 July 18, the whole lower Galilee from Haifa bay to Lake Kinneret was captured by Israel. Originally the operation was to be done on July 8, immediately after the first truce, by Irgun and Lehi but it was delayed by David Shaltiel possibly because he did not trust their ability after their failure to capture Deir Yassin without Haganah's assistance. The Irgun forces that was commaned by Yehuda Lapidot (Nimrod) was to break through at The New Gate, Lehi to break through through the wall stretching from the New Gate and the Jaffa Gate and the Beit Hiron Batallion to strike from Mount Zion. The battle was planned to begin at the Sabbath, 20.00 Friday July 16 a day before the Second Cease-fire of the Arab-Israeli war. The plan went wrong from the beginning and was first postponed first to 23.00 then to midnight. It wasn't before 02.30 that the battle actually begun. The Irgunists managed to break through at the New Gate but the other forces failed in their missions. At 05.45 in the morning Shaltiel ordered a retreat and to cease the hostilities. 19.00 July 18, the second truce of the conflict went into effect after intense diplomatic efforts by the UN. 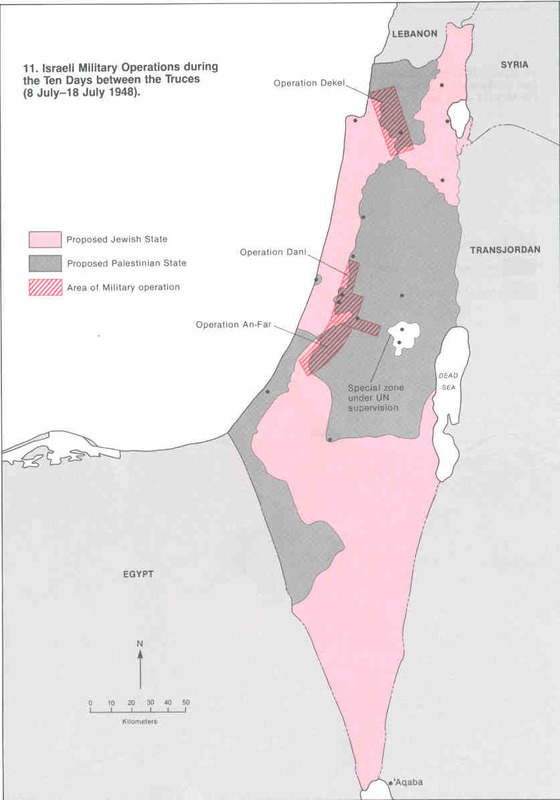 On September 16 Folke Bernadotte proposed a new partition for Palestine in which Transjordan would annex Arab areas including the Negev, al-Ramla, Lydda. A Jewish state in the whole Galilee, internationalization of Jerusalem and return or compensation for refugees. The plan was once again rejected by both sides. On the next day, September 17, Bernadotte was assassinated by the Lehi and his deputy the American Ralph Bunche replaced him. During the truce the Israelis cleaned up the captured Arab villages. Villages where the Arab population hadn't yet left were cleansed and many of the deserted villages were dynamited for military reasons. In December 1948, the UN General Assembly passed Resolution 194 which declared that "refugees wishing to return to their homes and live in peace with their neighbors should be permitted to do so" and that "compensation should be paid for the property of those choosing not to return." It was summarily ignored by Israel. In 1949, Israel signed separate ceasefire agreements with Egypt on February 24, Lebanon on March 23, Transjordan on April 3, and Syria on July 20. Israel was able to draw its own borders, occupying 70% of Mandatory Palestine, fifty percent more than the UN partition proposal allotted them. These borders have been known afterwards as the "Green Line". 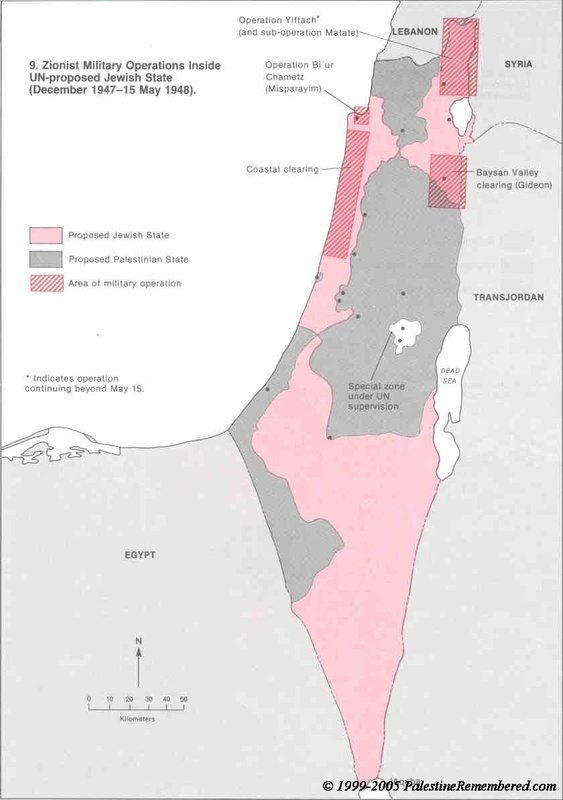 The Gaza Strip and West Bank were occupied by Egypt and Transjordan respectively. The humiliation of the Arab armies at having been routed by the Jewish forces, together with the rising nationalist frenzy in Arab nations, contributed to rising hatred for the Jews living in Arab lands. The status of Jews in Arab states varied greatly from state to state. Some observers wish to maintain that the Jewish populations were more "prevented from leaving" than "expelled". Their civil liberties, too, were in many cases vastly inferior to of their Muslim fellow citizens. For example, in Yemen, Jews were and are prohibited from carrying weapons of any type, even to the point of prohibiting traditional ceremonial Yemeni knives, carried by a large portion of the Yemeni population. The net result was that after over two thousand years of living in Arab controlled countries, the atmosphere was sufficiently anti-Jewishly charged that almost to a man, entire communities of Jews in the hundreds of thousands felt they had no option but to take leave of old homes and move to the uncertainties of the new Jewish state of Israel in effect becoming "refugees" in everything but name. These fears were compounded by the Holocaust, which ended with the defeat of Nazi Germany three years before the founding of the state of Israel. Arabs Palestinians have staged annual demonstrations and protests on May 15 of each year, one day after the anniversary of Israel's declaration of independence. The popularity and number of participants in these annual al Nakba demonstrations has varied over time, though the increasing anti-Israeli sentiment in the Middle East has tended to increase the attendance in recent years. During the al-Aqsa Intifada incited by the PLO after the failure of the Camp David 2000 Summit, the attendance at the demonstrations against Israel have increased exponentially.